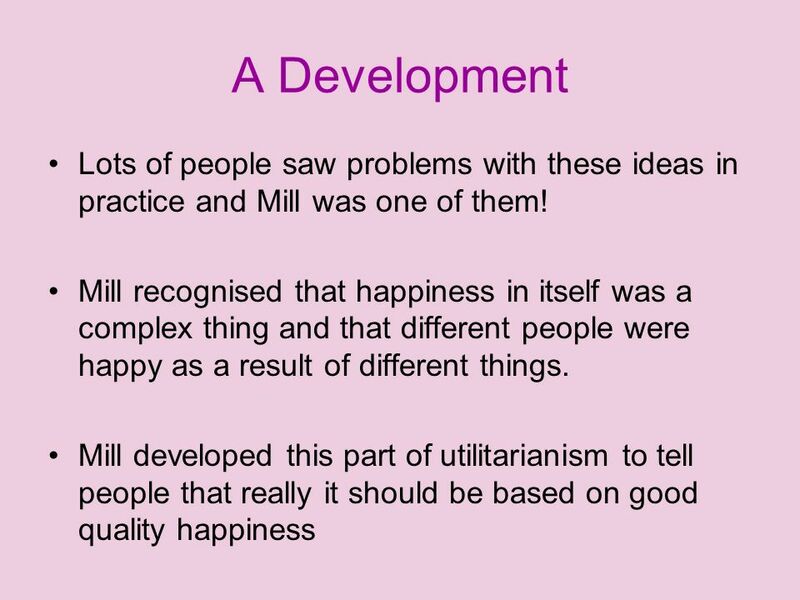 Utilitarianism These slides are intended to remind you of the main points (features). You should also be using your booklets and doing further reading. 2 Why did the theory come about? 4 Principle of Utility “This is an action that is right if it produces the greatest amount of good for the greatest amount of people.” This means that when making a moral decision the best or most moral action we can perform is one that will enable to bring the best consequences to come out for the majorities happiness. 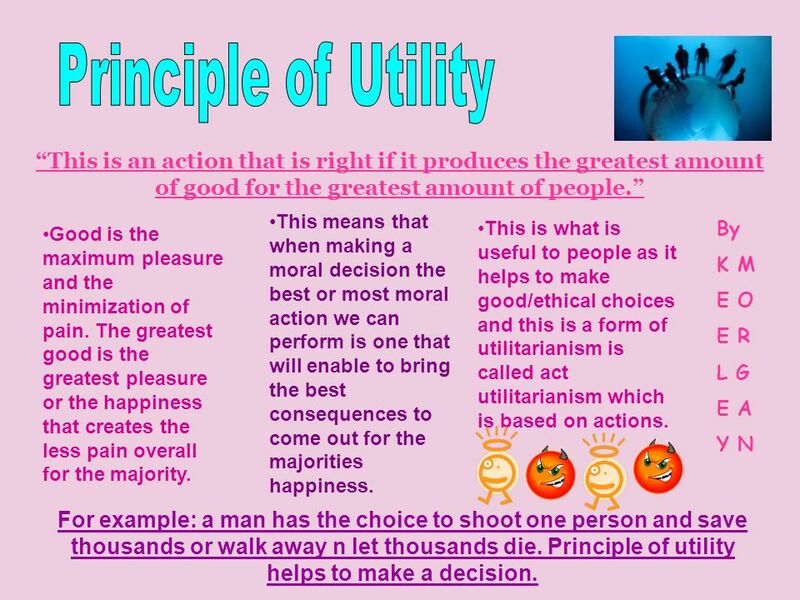 This is what is useful to people as it helps to make good/ethical choices and this is a form of utilitarianism is called act utilitarianism which is based on actions. By K M E O E R L G E A Y N Good is the maximum pleasure and the minimization of pain. The greatest good is the greatest pleasure or the happiness that creates the less pain overall for the majority. For example: a man has the choice to shoot one person and save thousands or walk away n let thousands die. Principle of utility helps to make a decision. 5 Problems!?! What about the minority? 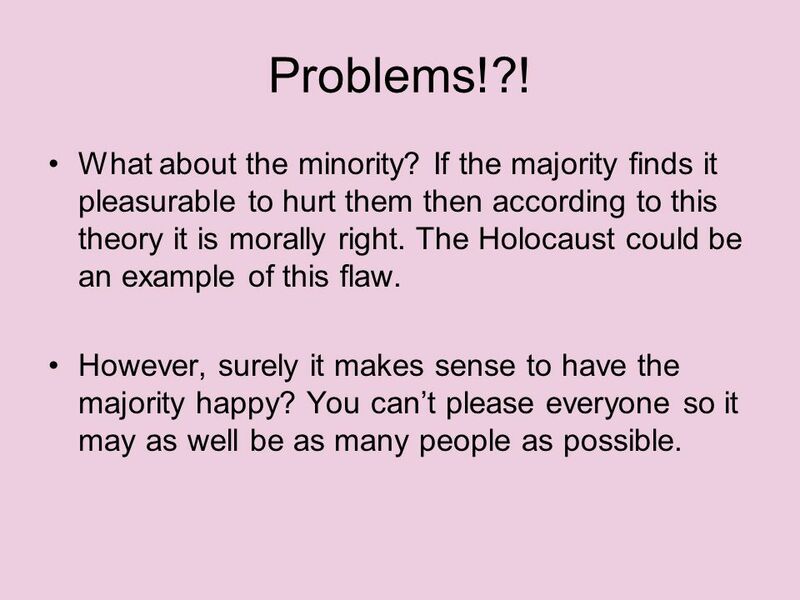 If the majority finds it pleasurable to hurt them then according to this theory it is morally right. The Holocaust could be an example of this flaw. However, surely it makes sense to have the majority happy? You can’t please everyone so it may as well be as many people as possible. 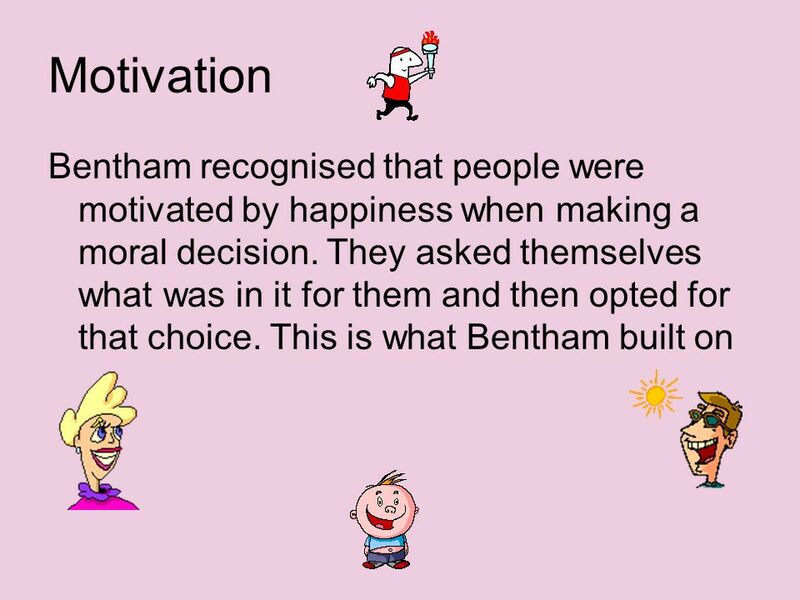 In order to help people make the right choice which brought about happiness to the most number of people Bentham devised the Hedonic Calculus. This is the idea of how to calculate happiness by adding up the happiness and subtracting the pain. This is done by using 7 different criteria. 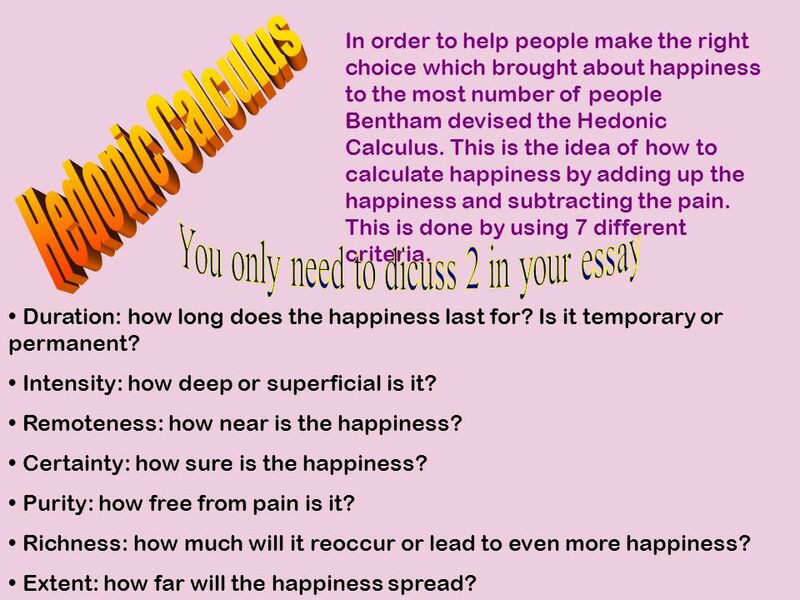 Hedonic Calculus You only need to dicuss 2 in your essay Duration: how long does the happiness last for? Is it temporary or permanent? Intensity: how deep or superficial is it? Remoteness: how near is the happiness? Certainty: how sure is the happiness? Purity: how free from pain is it? Richness: how much will it reoccur or lead to even more happiness? Extent: how far will the happiness spread? 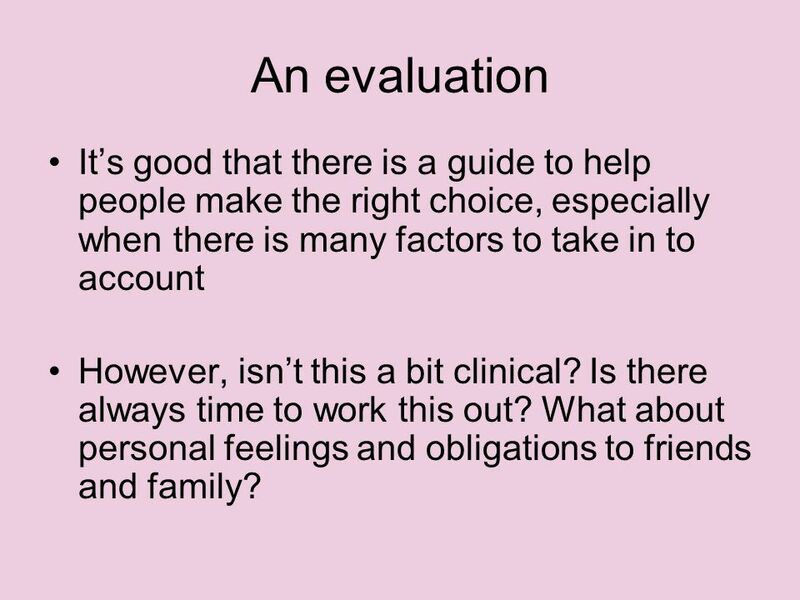 7 An evaluation It’s good that there is a guide to help people make the right choice, especially when there is many factors to take in to account However, isn’t this a bit clinical? Is there always time to work this out? What about personal feelings and obligations to friends and family? Mill said that happiness is ‘much too complex and indefinite’ to be the measure of moral worth Rule utilitarianism is the idea that trial and error throughout human history has led us to know what leads to happiness or not, and that in the long run if everyone followed secondary principles worked out from history (such as do not lie) then happiness for the majority would result Rule utilitarianism proposes that we consider the practical consequences of an action before carrying it out, not to assess each situation as if it were new but to follow rules that have been established according to the principle of utility. 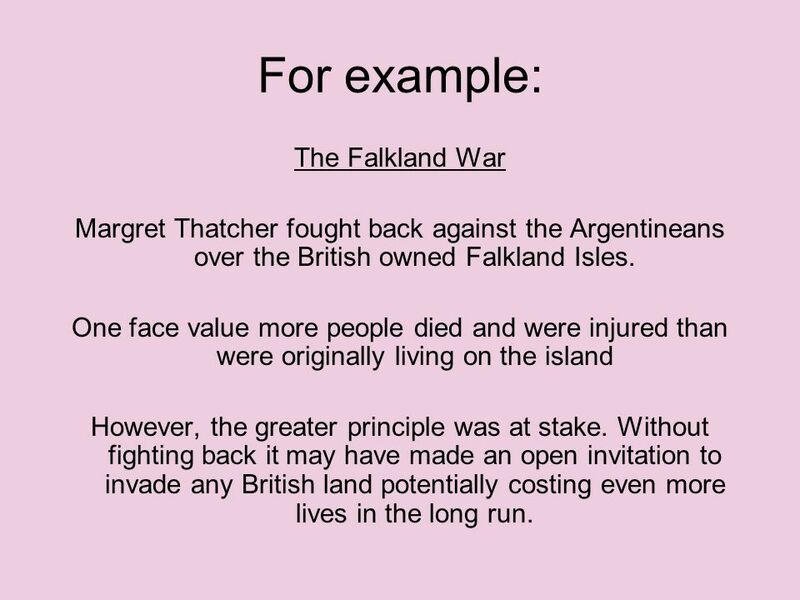 Margret Thatcher fought back against the Argentineans over the British owned Falkland Isles. One face value more people died and were injured than were originally living on the island However, the greater principle was at stake. Without fighting back it may have made an open invitation to invade any British land potentially costing even more lives in the long run. 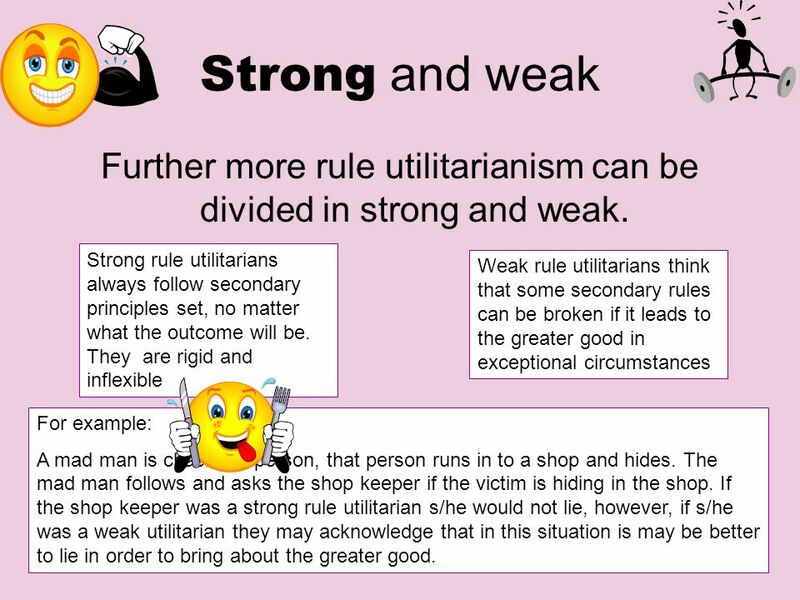 13 Further more rule utilitarianism can be divided in strong and weak. Strong rule utilitarians always follow secondary principles set, no matter what the outcome will be. They are rigid and inflexible Weak rule utilitarians think that some secondary rules can be broken if it leads to the greater good in exceptional circumstances For example: A mad man is chasing a person, that person runs in to a shop and hides. The mad man follows and asks the shop keeper if the victim is hiding in the shop. If the shop keeper was a strong rule utilitarian s/he would not lie, however, if s/he was a weak utilitarian they may acknowledge that in this situation is may be better to lie in order to bring about the greater good. 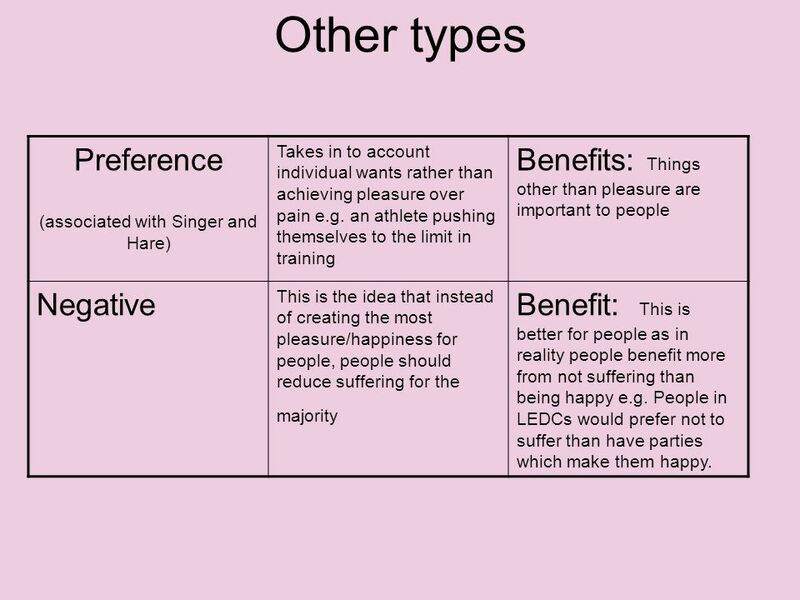 Other types Preference (associated with Singer and Hare) Takes in to account individual wants rather than achieving pleasure over pain e.g. an athlete pushing themselves to the limit in training Benefits: Things other than pleasure are important to people Negative This is the idea that instead of creating the most pleasure/happiness for people, people should reduce suffering for the majority Benefit: This is better for people as in reality people benefit more from not suffering than being happy e.g. People in LEDCs would prefer not to suffer than have parties which make them happy. 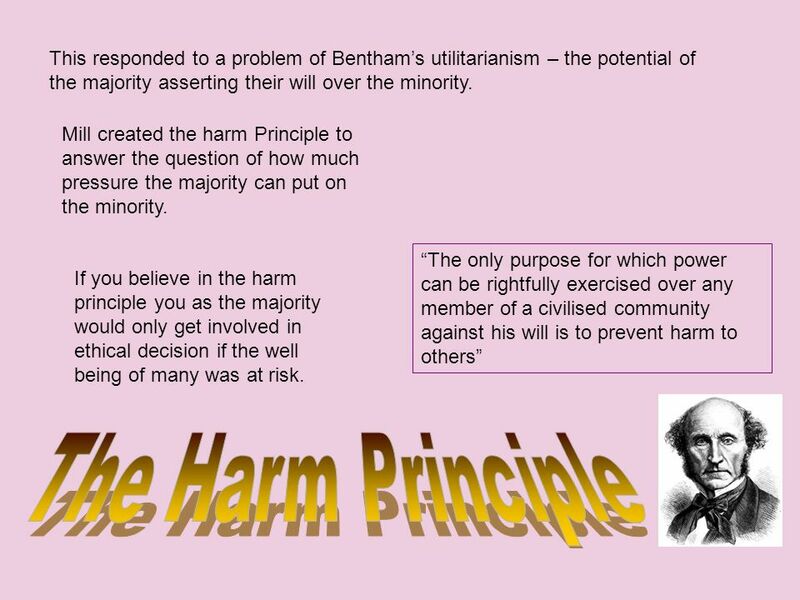 Utilitarianism is good as it takes in to account the consequences of an action. While motives may be good or bad, only consequences have a real effect on human well-being. It is reasonable to link morality with the pursuit of happiness and the avoidance of pain and misery. It is an application which does not rely on any conventional or unverifiable theological or metaphysical claims or principles. It asks us to consider no more than the greatest good for the greatest number. The principle encourages a democratic approach to decision making. The majority’s interest is always considered so a dangerous minority can not dominate. 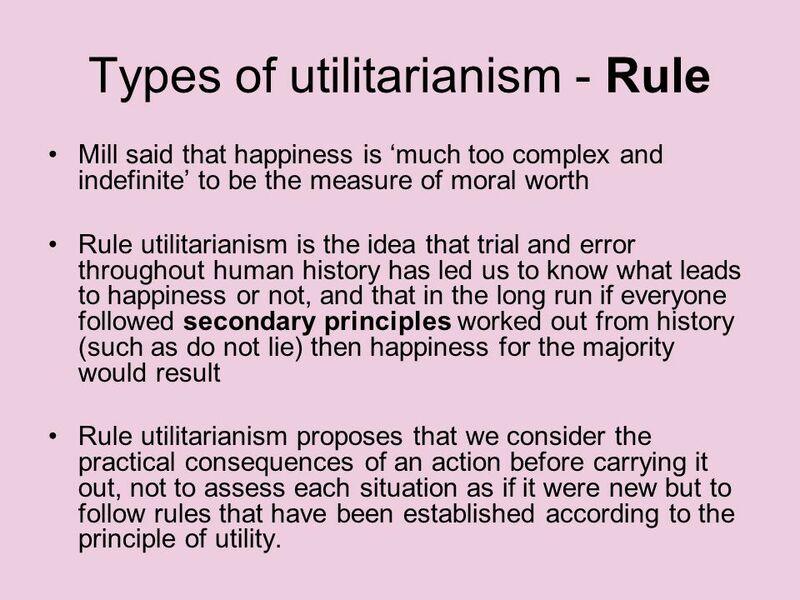 Utilitarianism does offer a systematic way to make an ethical decision which is simple to understand and apply. In its historical context it did serve a purpose which was to put the majority first. Disadvantages/ Weaknesses However, even when we think we know the consequences they can often have a knock on effect and people can suffer second or third hand. It is difficult to measure pleasure. It is a practical application that requires the ability to predict the long term consequences, and to predict with unfailing accuracy. Of this there is no guarantee. The theory gives no credit to motivation. Not every action done out of good will is going to result in a good consequence, but the attitude behind it should be worthy of some credit. The theory is too simplistic – it relies on one principle only by which we make moral decisions. Every ethical dilemma is unique in some way and so we can not make a decision on just one ethical theory. In the past the principle of utilitarianism has been used to justify the most horrifically immoral acts – the Holocaust for one. 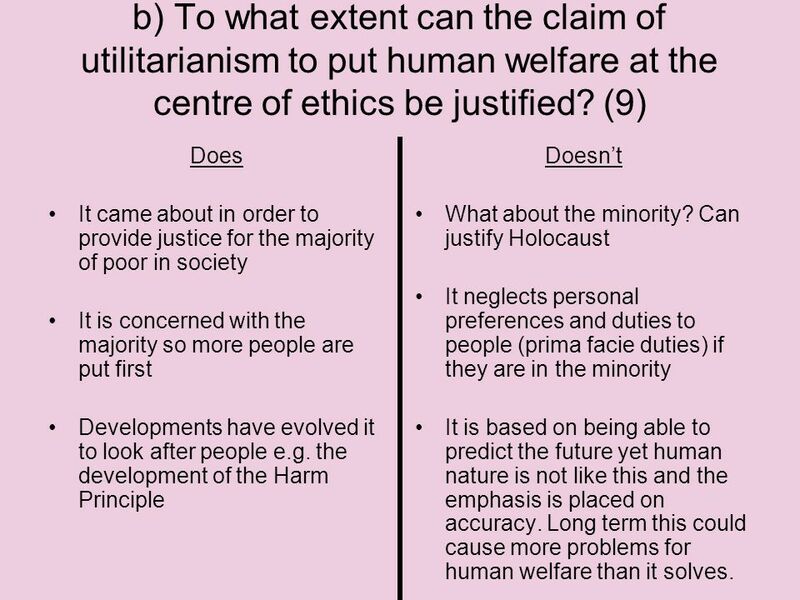 17 b) To what extent can the claim of utilitarianism to put human welfare at the centre of ethics be justified? (9) Does It came about in order to provide justice for the majority of poor in society It is concerned with the majority so more people are put first Developments have evolved it to look after people e.g. the development of the Harm Principle Doesn’t What about the minority? Can justify Holocaust It neglects personal preferences and duties to people (prima facie duties) if they are in the minority It is based on being able to predict the future yet human nature is not like this and the emphasis is placed on accuracy. Long term this could cause more problems for human welfare than it solves. 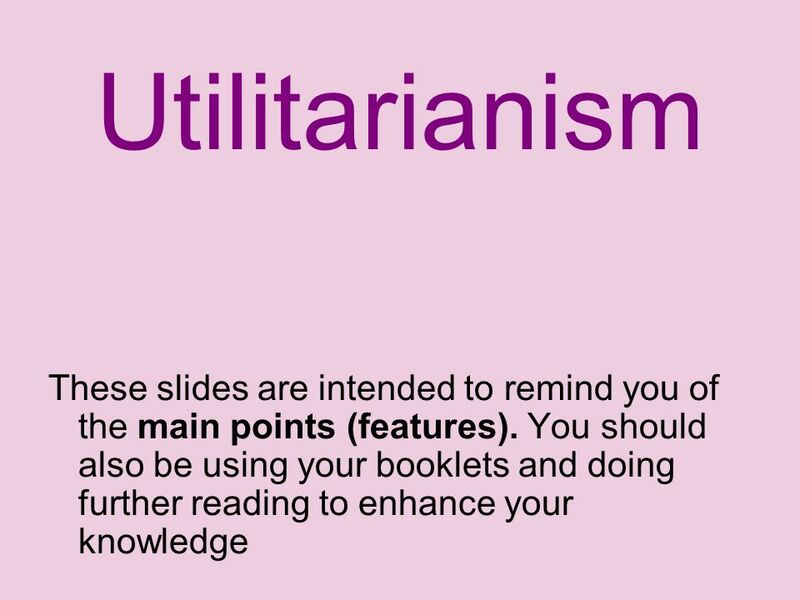 Download ppt "Utilitarianism These slides are intended to remind you of the main points (features). You should also be using your booklets and doing further reading." 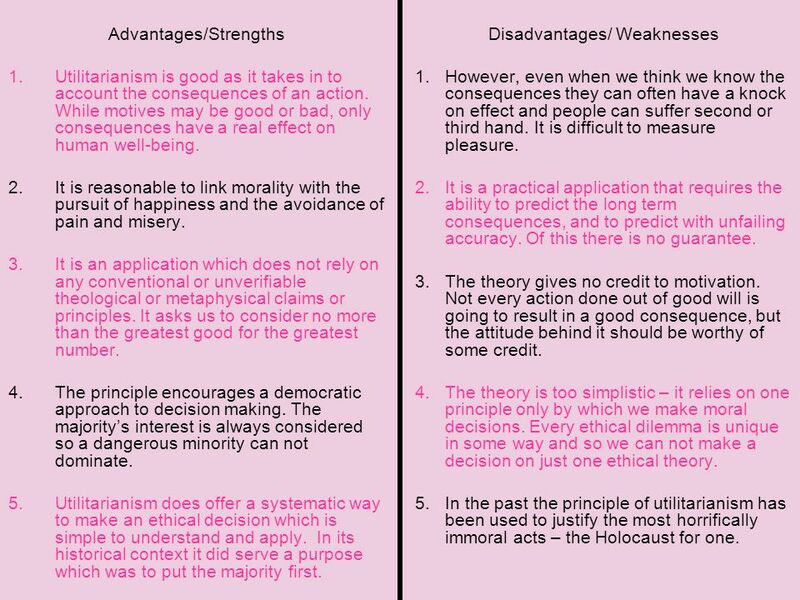 Higher RMPS Lesson 4 Kantian ethics. What is a normative theory? 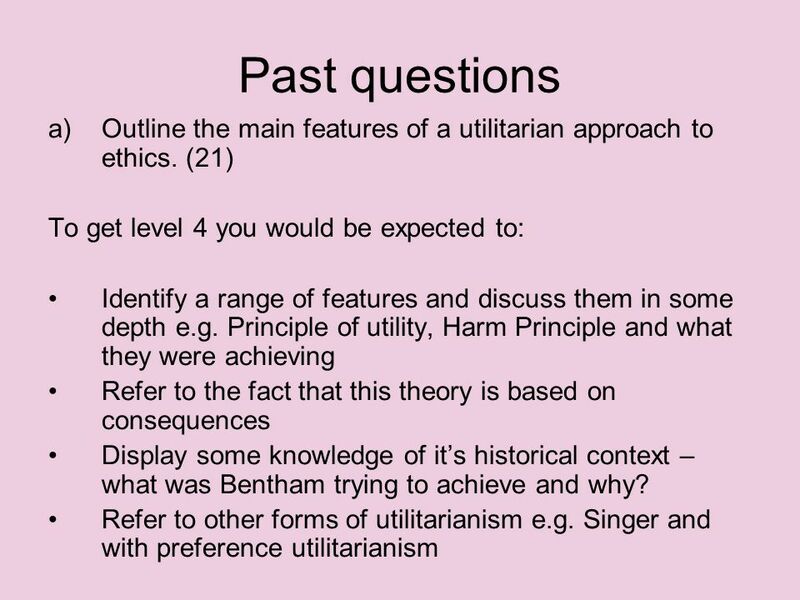 Introduction to Ethics Lecture 11 Utilitarianism By David Kelsey. Before we get to this standard, we must understand that in Ethics, there are two types of Ethical Standards: §Consequential Ethical Standards §Nonconsequential. 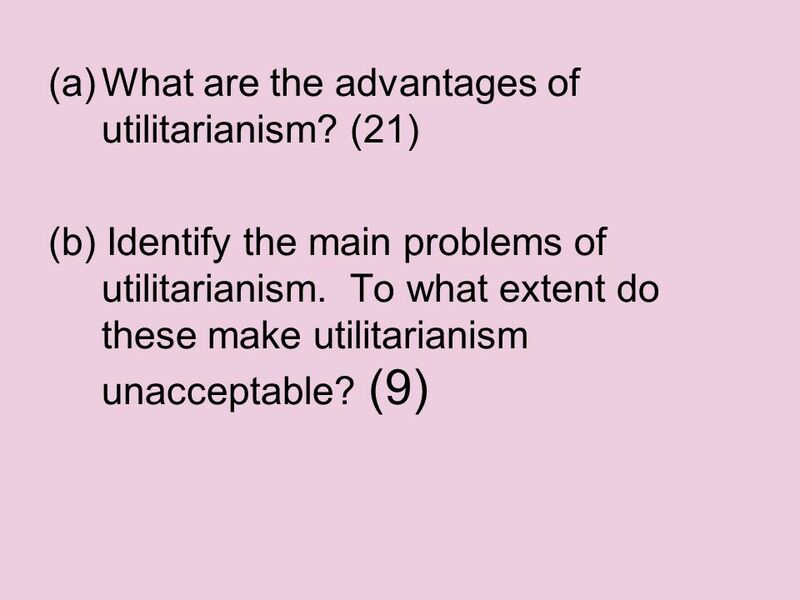 PHIL 2525 Contemporary Moral Issues Lec 13 Utilitarianism Chapter 7. Ethics and Morality Theory Part 2 11 September 2006. 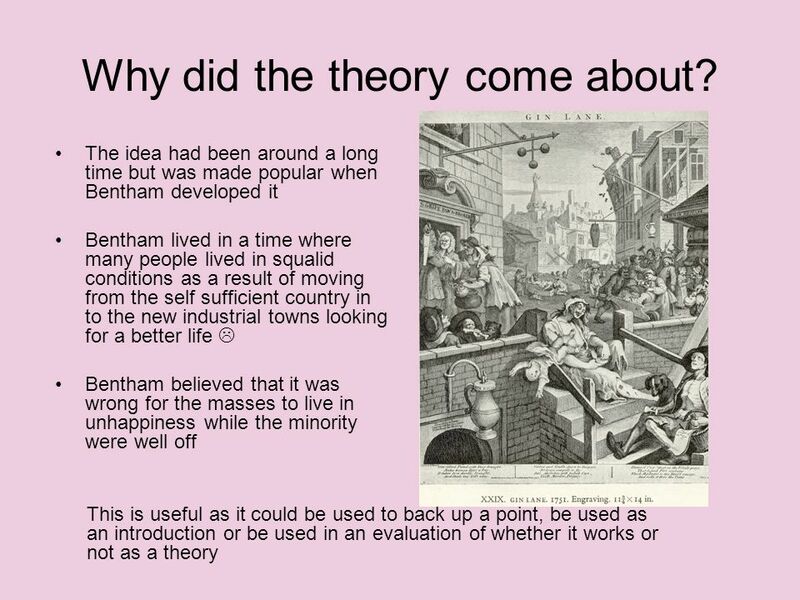 LO: to know about Mill’s approach to Utilitarianism HMK: Can you come up with an ethical situation and outline where Bentham and Mill would disagree on.